Why Nike, Pepsi, and Costco stocks could make big moves in the coming days. Stocks rose last week as investors felt bullish in the wake of the Federal Reserve's decision to hold off on raising interest rates. 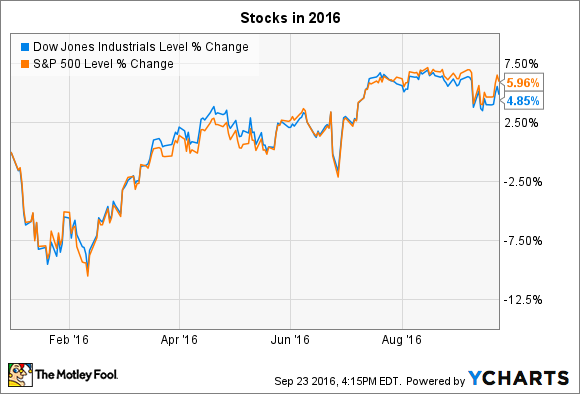 The Dow Jones Industrial Average (DJINDICES:^DJI) and S&P 500 (SNPINDEX:^GSPC) each ticked up by about 1% to add to their 2016 gains. Looking ahead, a few of the market's largest companies will post earnings results over the next few days. Shareholders of Nike (NYSE:NKE), Costco (NASDAQ:COST), and Pepsi (NASDAQ:PEP) could see big moves in their investments in response to these operating trend updates. Nike's stock is limping into this week's earnings release and is currently tied with Disney as the Dow's worst performer year to date. The footwear giant managed record earnings at its last quarterly check-in, but also revealed a few challenges, including declining apparel sales in the U.S. and a gross profit margin that's been ticking lower. Meanwhile, the company warned investors to brace for a bumpy start to its 2017 fiscal year. Profitability should take another hit thanks to foreign exchange swings and surging expenses tied to marketing around the Olympics. CEO Mark Parker and his executive team believe that the shortfall will be temporary, though, as gross margin expands for the full year and sales growth picks up in key markets like the U.S. and China. Investors will be listening for any update to that 2017 outlook. As for this week, consensus estimates are calling for profits to fall by 16%, to $0.56 per share, despite a 6% sales uptick, to $8.9 billion. Costco closes its fiscal 2016 year with a quarterly report on Thursday afternoon. The warehouse retailer's revenue gains have been slowing lately: Comparable-store sales rose by 2% in the U.S. this quarter compared to 3% in fiscal Q3, and 4% in fiscal Q2. In Thursday's results, investors will be looking for evidence that Costco's operations are threatened by the price deflation that's hurt grocery rivals like Kroger. Membership numbers will also be closely followed, given that this quarter included fallout from the retailer's switch to a new loyalty card. If executives didn't notice any long-term damage from that move and instead see that the new benefits are producing happier shoppers, then the stock could have a good week. Strong membership numbers, after all, would likely give management confidence to roll out another subscriber fee increase sometime in fiscal 2017 -- its first boost in years. Pepsi posts its quarterly results before the opening bell on Thursday. The drinks and snack giant's stock is beating rival Coca Cola (NYSE:KO) so far this year thanks to a solid sales outperformance. Organic volume was up 2% in its beverage business last quarter compared to flat results at Coca Cola. Pepsi also raised its full-year outlook following those results, while Coke pulled its forecast down. We'll see whether Pepsi can keep the positive momentum going this week. Consensus estimates call for sales to fall 3% -- thanks mainly to foreign currency swings – as earnings tick down to $1.31 per share from $1.35 per share in the prior-year period. CEO Indra Nooyi will likely discuss the portfolio transformation that's seeking to adjust to changing consumer preferences through products like Propel enhanced water and a real-sugar version of Mountain Dew. Similar innovations, or what management calls "guilt free" products, in its snack brands could help the food giant continue snatching market share despite slow overall global growth in the industry.